How were the genres of literature changed by new methods of serialization and publishing? How did a widespread culture of performance emerge in the period to shape as well as to be shaped by the novel and poetry? 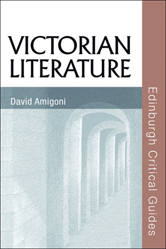 David Amigoni draws on the most recent critical approaches to the novel, Victorian melodrama and poetry to answer these and other questions. The work of Charles Dickens, George Eliot, Oscar Wilde, Alfred Tennyson, Robert Browning, Christina Rossetti, Thomas Hardy, Thomas Carlyle and Mathew Arnold are explored in relation to ideas about fiction, journalism, drama, poetry, the New Woman, gothic, horror and the Victorian sage.